Today, more and more youth with disabilities seek to have the opportunity to be part of recreation and competitive sport. Now, more than ever, laws and opportunities are in place to make this a reality. Unfortunately, there is still great health disparities for children with disabilities. We have over 5.2 million children with disabilities but the opportunity for participation in recreation and competitive sport seems to fall by the way side. It appears that at times no one wants to step up and make these opportunities a reality. How disappointing it is for children and youth that have the greatest health disparity are not given the highest priority for participation in recreation and competitive sport. As we approach the celebration of the 25th year of ADA, it seems as if we still have many kids screaming to be let on the court. Once the other kids let me on the court, I did make it harder on them. In a wheelchair I played against “able bodied” kids or “AB’s” I kept up and even surpassed these kids. Now I’m 21 years old and I’m a division one athlete. As I travel the country, I still see other kids that won’t be included due to a physical disability. My advice to those kids is to give up. No, not give up on their hopes and dreams but give up the thought that they aren’t good enough to play sports. Give up on the thought of a world in which we are not equal in body, mind, and spirit. Give up the idea that we are not the epitome of greatness in training. I know what I am, and I know the potential of youth with disabilities because I was once one of these youth. I,too, was wanting to get on the court and show that I am an athlete. We are, who we know we are. We are all athletes. It’s time to let all youth with disabilities have the opportunity to make things harder on everyone else. Makara Daniel Nong I was born "lucky". I was born with not only one leg, but with the motivation and drive to be successful. I was exposed to sports at the tender age of five and from there the rest is history. Throughout the past 15 years I have participated in various sports such as wheelchair tennis,hockey, and football. Where I excel most is in wheelchair basketball. 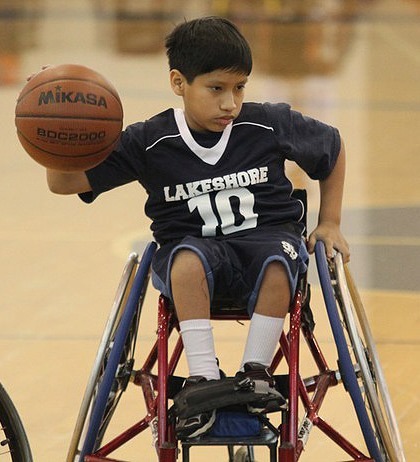 Through my academic prowess and passion for basketball I earned a full athletic scholarship to play wheelchair basketball for the University of Illinois at Urbana-Champaign. I am extremely fortunate to have basketball as my vehicle on my road to a degree in recreation, sports, and tourism and possibly a master's degree in kinesiology. Since September of 2013, I have been interning at the Lakeshore Foundation and have enjoyed the experience of interacting with many different amazing people and learning about their adaptations in life. Right on Daniel. There are so many existing laws that it seems like schools and even communities should be addressing inclusive activities or even adapted activities for people with disabilities across the board.